My dear readers, I did not abandon my blog. We were traveling to Jamaica (the report is coming) plus we have an exchange girl from Russia living with us now. Plus it is cold in Atlanta and schools are closed which means my time is not mine anymore, but kids’. However, this week is special and I couldn’t miss it. Some have Mardi Gras, some celebrate Chinese New Year, but Slavics have Maslenitsa! Maslenitsa is Slavic Spring Festival – a celebration of the end of winter and the start of warmth, fun, hope and growth. Not surprisingly, it is a big deal in Russia. From first-on-google-come reliable source(Wikipedia) Maslenitsa (Russian: Ма́сленица, Ukrainian: Масниця, Belarusian: Масьленіца, also known as Butter Week, Crepe week, or Cheesefare Week), is an Eastern Slavic religious and folk holiday. It is celebrated during the last week before Great Lent—that is, the eighth week before Eastern Orthodox Pascha (Easter). Maslenitsa corresponds to the Western Christian Carnival, except that Orthodox Lent begins on a Monday instead of a Wednesday, and the Orthodox date of Easter can differ greatly from the Western Christian date. Maslenitsa has its origins in both pagan and Christian traditions. In Slavic mythology, Maslenitsa is a celebration of the close end of the winter. During Lent, meat, fish, dairy products and eggs are forbidden. Thus, Maslenitsa represents the last chance to partake of dairy products and those social activities that are not appropriate during the more prayerful, sober and introspective Lenten season. Maslenitsa activities also include snowball fights, sledding, riding on swings and plenty of sleigh rides. In some regions, each day of Maslenitsa had its traditional activity: one day for sleigh-riding, another for the sons-in-law to visit their parents-in-law, another day for visiting the godparents, etc. As the culmination of the celebration, on Sunday evening, Lady Maslenitsa (which also represents Winter) is stripped of her decoration and put to the flames of a bonfire. 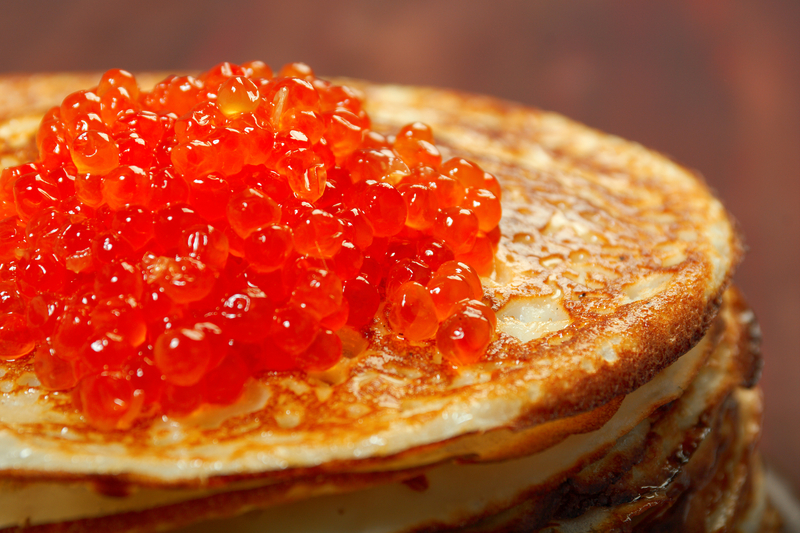 Sure enough that the most characteristic food of Maslenitsa is bliny (pancakes or crepes). Round and golden, they are made from the rich foods still allowed by the Orthodox tradition that week. During pagan times, the round and golden shape and color signified praise to the Sun because of pancakes’ resemblance to it. I also found a video on Youtube-they show it step by step. The best pan to use is a cast iron one, not what they show on the video. Posted on February 20, 2015 February 20, 2015 by YuliaPosted in Cooking with a foreign accent, It's culturalTagged Chinese New Year, cultural differencies, holiday, Russian culture.